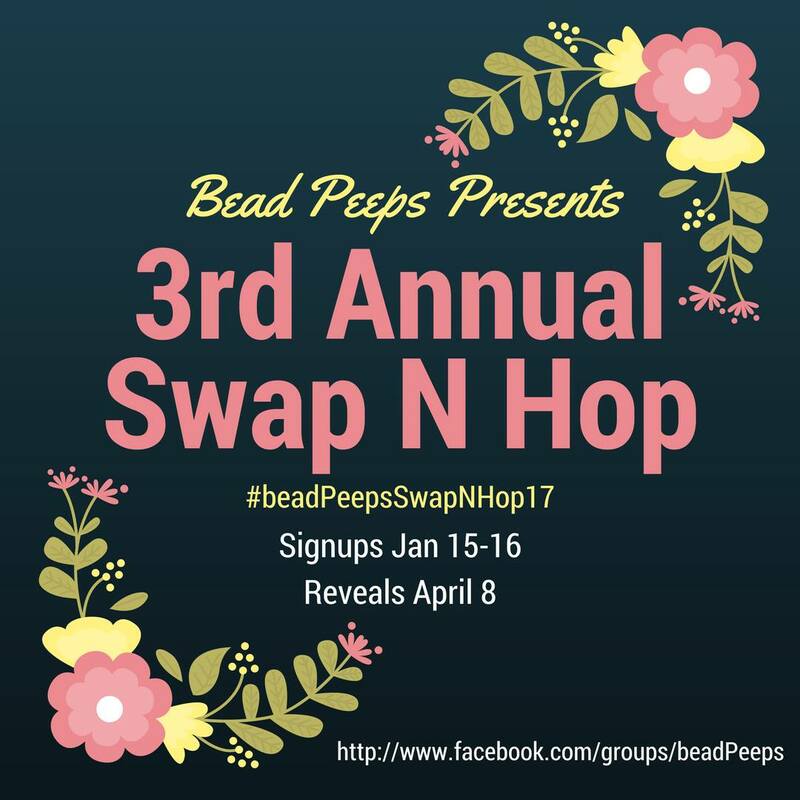 I'm participating in the Bead Peeps Swap n Hop this year. While this is the third year of the challenge, It's my first time participating. Basically, you are paired up with another jewelry artist and the two of you swap a focal, beads, and a clasp. One of those elements need to be artist-made, and you have to send at least two of those three elements. From there, you make jewelry from the pieces received! Fun stuff!! Bead Peeps is a Facebook group administered by Linda Anderson. We were supposed to get an intro post up before she made the partner assignments. However, I was so busy with the ball (Mardi Gras) and family obligations that I completely missed that somehow. Despite missing the deadline, I still want to make this post for future reference. I'm tossing in some examples of my jewelry designs throughout this post to give examples of my work. Here we go! 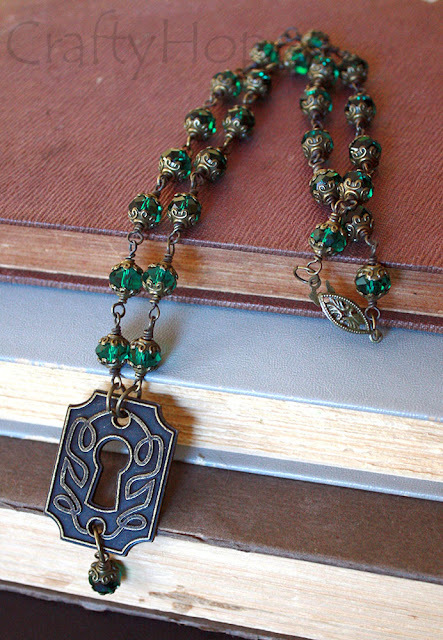 A scrapbooking keyhole is the focal with a small Gaea flower connector. Vintaj wire was used to wrap glass pearls and glass beads to make the chain. The arc on these is from some old earrings I took apart. The beads are a combination of glass, stone, and metal beads that worked well together. I've been making jewelry for over 15 years. In that time, I've experimented and played with many techniques: decoupage, polymer clay, precious metal clay, metal etching, resin, etc. I started with stringing, but really love to use wire in my work. Though, stringing and knotting do come into play occasionally. The color palette for this was a little out of my comfort zone, but I do love it. 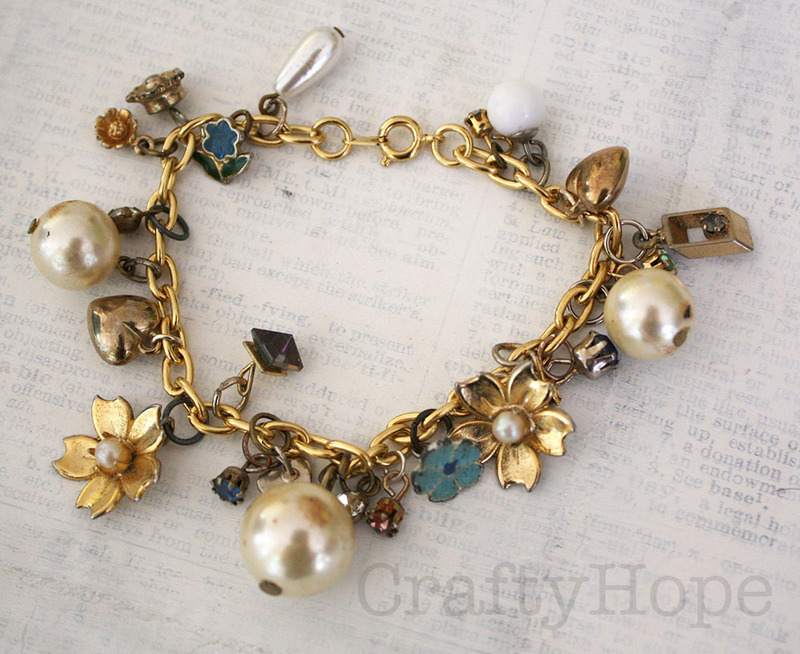 It incorporates a vintage button and vintage glass beads, freshwater pearls, stone beads, and seed beads into a really cute bracelet. This was made for ZnetShows' Creative Spark publication and includes their cultured sea glass and tiny Chinese crystals. 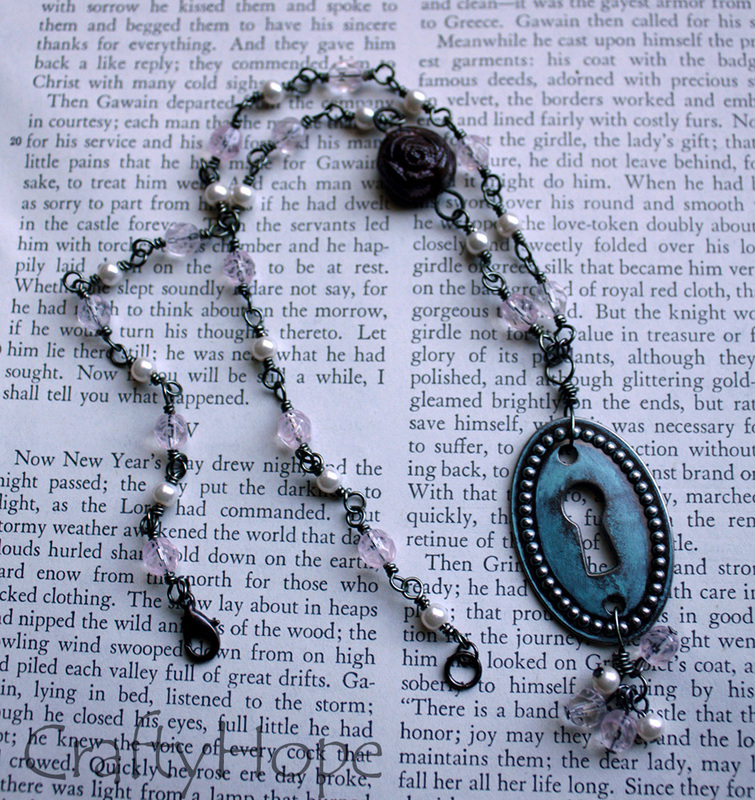 I really like the layering of this necklace. Beads are indeed a staple in my work, but my favorite is designing with the unusual. This includes recycling old jewelry from thrift and antique stores, using hardware, upcycling items found on the street, etc. However, I'm not completely consistent with those methods. It just depends on the materials. In addition, I enjoy altering materials (both typical and the unusual) to suit my needs. 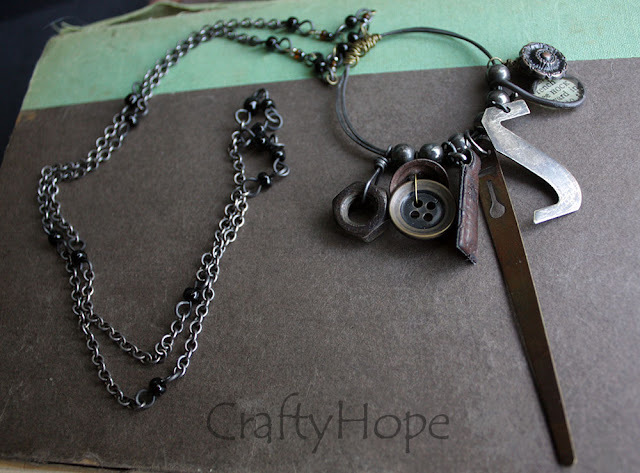 The dangly parts of this necklace are almost all found objects! A scrapbook brad and a wired resin piece I made are also included. I wear this necklace often. Playing with wire, I came up with these earrings. I love how the Czech glass beads slide side to side on their bar. For years I've had a hard time defining my style. I now feel as though my focus is beginning to narrow. 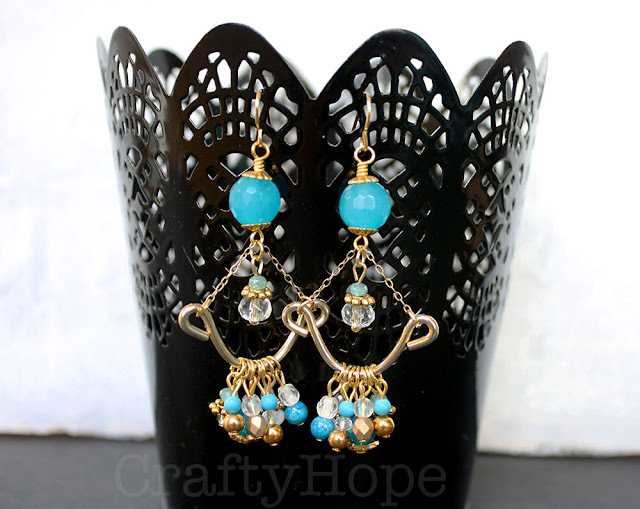 Most of the pieces I make and like tend to have a romantic and boho feel to them. However, a bit of tribal does get thrown in from time to time. These feel both romantic and tribal to me. 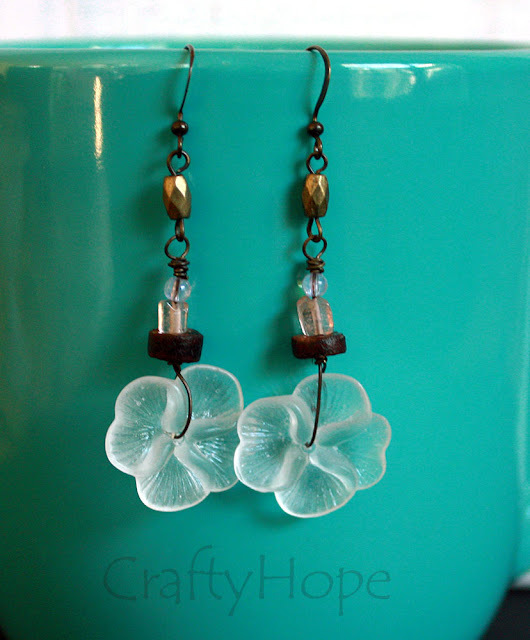 The softness of the Lucite flower and pink beads are contrasted with the dark wood and shiny metal. All of the charms in this bracelet came from old jewelry. Most of them are post earrings I wasn't sure how else to use. I incorporated a variety of jump rings in order to give it a slightly less fancy feel. 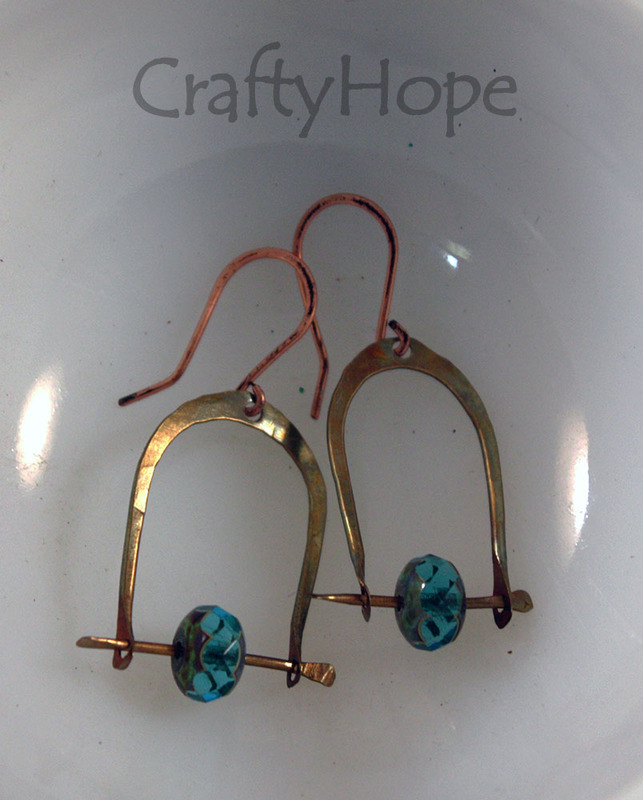 I often use glass and stone beads and antiqued metals. Though, that's not consistently the case - I will use a shiny gold or silver tone depending on how I'm inspired. 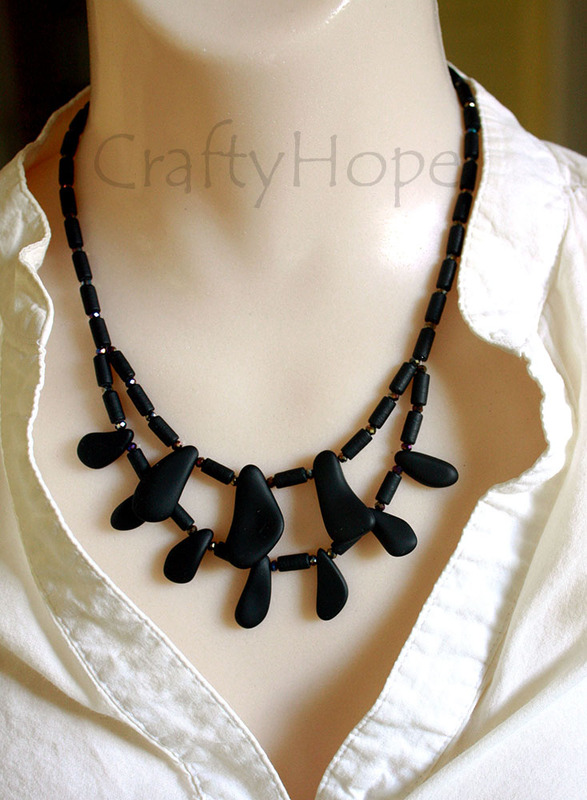 And, I don't always use beads - buttons are a real favorite of mine and seem to worm their way into my pieces. 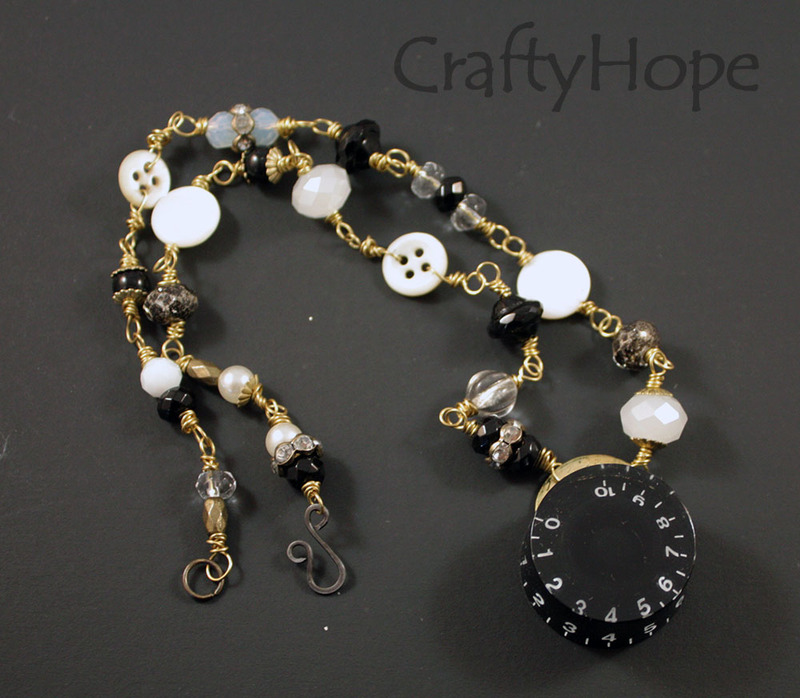 I made the stacked button focal before the necklace came together. The collar style of necklace is just so cute. I think it pairs well with the buttons. 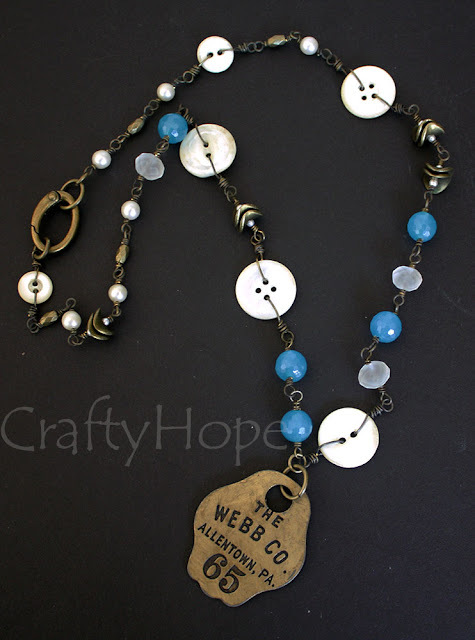 I found the Webb Co. tag in an antique store and knew it would be a great addition to a long necklace. To add to the found object feel, the mother of pearl buttons were included in the chain. I veer toward anything rustic, old, vintage-y. I love most colors, but do have a hard time incorporating anything too bright into my jewelry. Blues, greens, and neutrals tend to be my go-tos. That's a guitar volume knob as the focal to this necklace. I kept a simple palette with an array of beads to accent the knob. 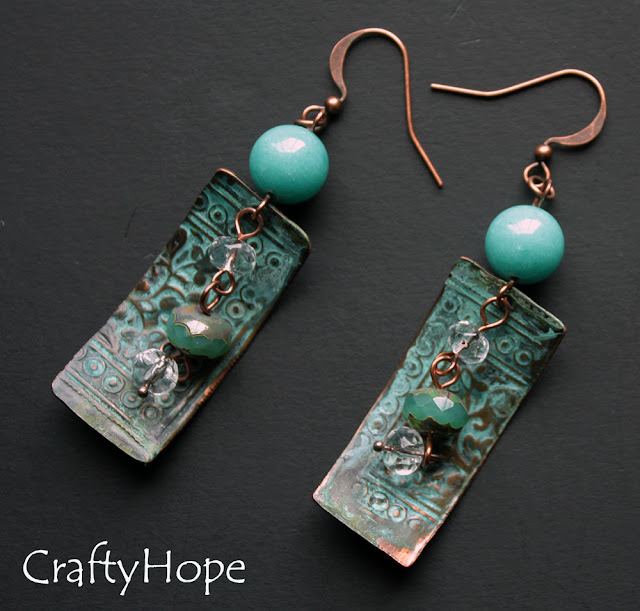 I bought the altered copper charms from Bandana Girl and simply added some coordinating beads. I'd like to say that I'm inspired by nature, but in reality I think it's the materials themselves that spark my imagination and creativity. 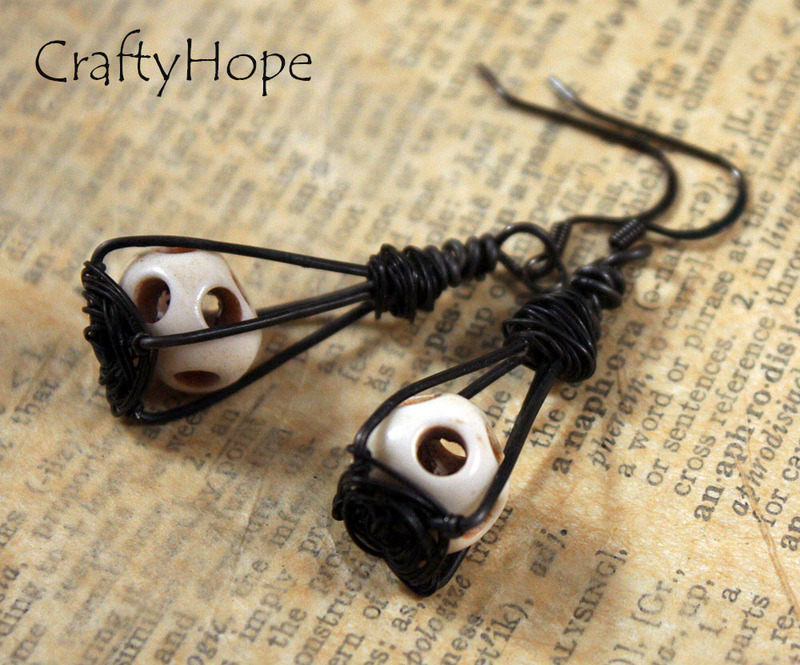 I had these holey bone beads for ages before I felt inspired to cage them in with some darkened annealed wire. This is one of the most recent listing in my etsy shop. Again, I used a scrapbooking keyhole in antiqued brass. The green beads and bead caps are from ZnetShows.com. It all seemed to just fall together perfectly. That about sums me up. There's probably something I've left out of this. Please don't hesitate to ask in the comments. Oh, and let me introduce my partner - Kari Asbury. She's using her Instagram to post about this swap, but she also has a blog on her KariAsbury.com website that she uses from time to time as well. Go check out her stuff. It looks like we have similar styles! Thanks Jenna! I was just trying to show examples of my jewelry. I hope these show a good range of what I like to make. :) I appreciate you popping in! so excited about our pairing for this swap! It's going to be lots of fun gathering goodies to inspire your muse and maybe a little something extra to challenge it! Kari, I'm excited too. I've already gathered a few things but have to get a few more. I have a tendency to go overboard sometimes. Ha! Thanks for stopping in! It looks like you have similar artistic visions with your partner, it's going to be very interesting what you two send to each other and what you make! Even though I have seen a lot of your jewelry, the caged bone beads just gave me an idea - I'd wire weave the cage to the top but you have left the beads visible, which is much better!